By Craig Murray. Mr. Murray is a former British intelligence analyst, British Ambassador to Uzbekistan, and chancellor of the University of Dundee. Originally posted at CraigMurray.org.uk. So what are the Clinton gang doing while Trump introduces anti-Muslim immigration discrimination? Oh, they are pushing for war with Iran, which might give pause to some who think the world would have been less awful had Hillary won. Here is the front page of the resolution introduced into the House of Representatives by Democrat Alcee L Hastings, an extremely close ally of Debbie Wasserman Schultz, who had to resign in disgrace as chair of the Democratic National Committee after WikiLeaks published emails establishing her corrupt endeavours to fix the primary elections for Hillary against Bernie Sanders. There is in fact no evidence that Iran is continuing a covert programme to produce nuclear weapons. British, French and Russian intelligence all assess that Iran is sticking to its agreements and – here is a key point – so do the CIA. But when did politicians ever let facts stand in their way? 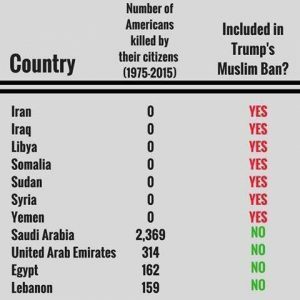 Trump’s mad visa ban, which excludes Saudi Arabia and the Gulf States which are the main financiers, armers, ideologues and exporters of Salafist terrorism, turns out to be imposed on the countries which were on Obama’s watchlist. 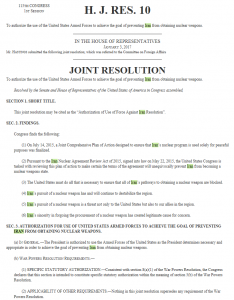 As the Hastings resolution shows, the anti-Iranian and pro-Saudi madness is bipartisan. To include Iran but exclude Saudi Arabia is further evidence of the twisting of US foreign policy to serve the interests of Saudi Arabia and its ally Israel. This infographic has been compiled based on research by the Cato Institute. I would add the caveat that it refers to terrorist attacks inside America. The full piece it is derived from is well worth reading. I am not in general a fan of the Cato Institute, but they deserve commendation for consistency in their anti-authoritarian line. These are dangerous times. And with the Democrats vying for “dumb patriot” support and seeking to outflank Trump to the right by roaring him on to a military attack on Iran, and seeking to push through legislation to promote that, there appear few influential voices of reason in the USA at present.